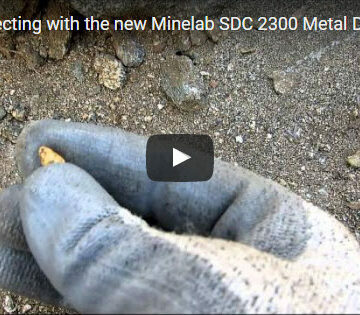 I recently published a video of a great day in the field with the new Minelab SDC 2300 gold nugget detector. Yeah, this is Rob, with Rob’s Detector Sales, and I’m testing the new SDC 2300…and I just found a little nugget, probably about 10 minutes ago. And I just scanned this bedrock here, and cleaned it out… (huge audible tones!) Got a really good target…thought for sure it was just going to be a big piece of iron rubbish, but if you look right down here (zooming in), I cleaned it out, right down on the bedrock right there, is a nice chunky nugget…see if I can get it out of there. Yeah, that’s one’s a good pennyweighter, and I thought with that screaming response, it was going to be trash…but a pretty nice nugget, found right here on bedrock, using the new Minelab SDC 2300: waterproof, collapsible, pulse induction gold-finding detector. Pretty impressed! The second nugget within a half-hour. Looking forward to picking some more nuggets out of this gulch… will keep you updated. This is Rob with Rob’s Detectors, out here in Surprise, Arizona, you can see us online at www.robsdetectors.com, have a good one!